The FixStation is truly a body shop in one box. It is a modern and innovative solution to ensure high productivity and fast delivery of one – or two – panel repairs and the key-to-key time is guaranteed in half a day. 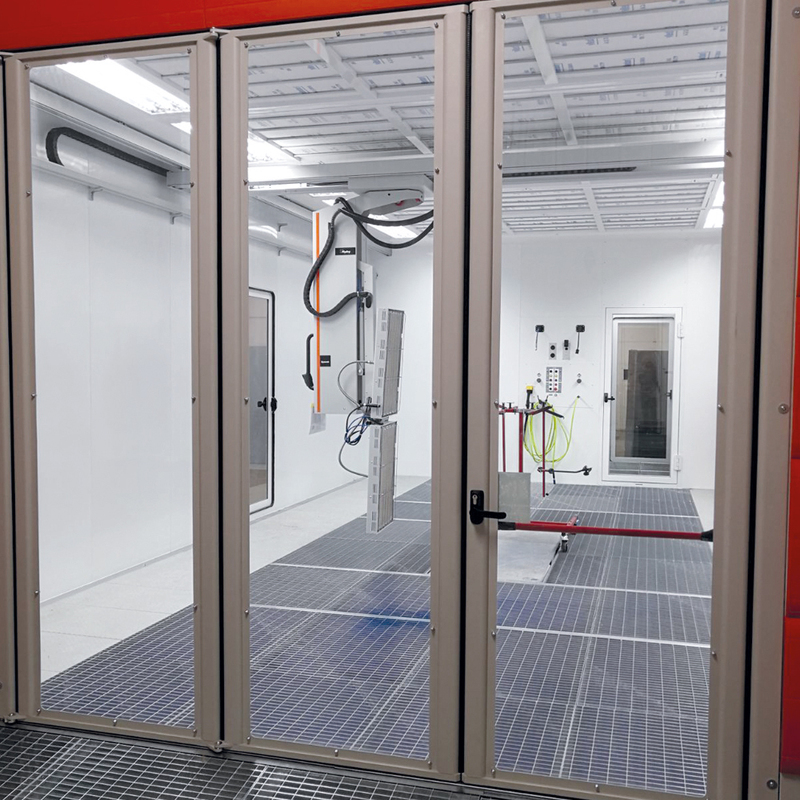 FixStation is a hybrid solution that works as a spray booth and a workstation, all in one spot. This solution allows one multi-skilled technician to perform an average of three to four repairs per day without moving the vehicle, which results in one repair every two to three hours. 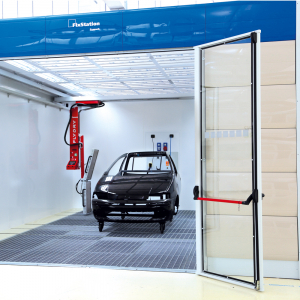 FixStation is a fully equipped workstation where a technician removes and installs parts, pulls dents, applies body filler, sprays primer, and sprays and dries waterborne/solvent basecoat and clear coat. FixStation is equipped with a FlyDry robot, a paint mixing room, a Vacuum Sanding system and a MultiBox with plugs and retractable air and electric. Vehicle lifts are commonly installed in FixStations but are optional. FixStation is available in multiple configurations based on length and height variables. 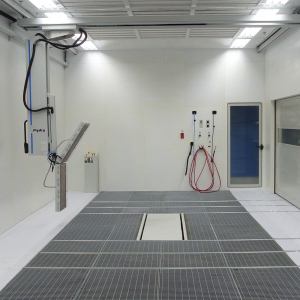 One option includes pneumatic doors and CarMover rails that allow two technicians to work together. Another option includes inlet fans that warm the air. The ventilation is at 24.000 cubic meters per hour or 14,125 CFM, for ideal air speed and performance inside the booth and fantastic abatement of overspray. The floor is designed with four different chambers. This design is unique to Symach and guarantees consistent and balanced airflow when the floor filters are in need of replacement due to excess overspray build-up. The PowerLight system, developed by Symach, guarantees impressive light on the vehicle and a perfect point of color for detailed paint application. 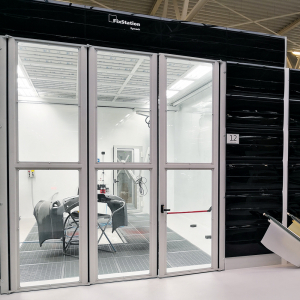 The FixStation has built-in technology and automation that recognizes the painting phase and changes the program automatically, using maximum speed of ventilation for spraying phases; average air speed for drying with the robot; and minimum air speed for climatization during other working phases. The painter never pushes any buttons. The front and side doors are pneumatic, up and down, and the external cover is CoverTop, ABS plastic panels that are available in eight different colors. > For the drying performance, please refer to the FlyDry catalog. – with warm air using the Solarys heating system. Spraying / This program uses 80% of the total ventilation and automatically starts when the painter uses the spray gun and stops when the painter finishes spraying. This guarantees that the maximum consumption of electricity and gas is only for the time needed to spray. Drying with FlyDry robot /This program uses 40% of the total ventilation to remove the gas and solvent produced during the drying treatment. Climatization /This program is available only in the version with inlet warm air. It uses 30% of ventilation and starts automatically when one of the phases previously mentioned ends. 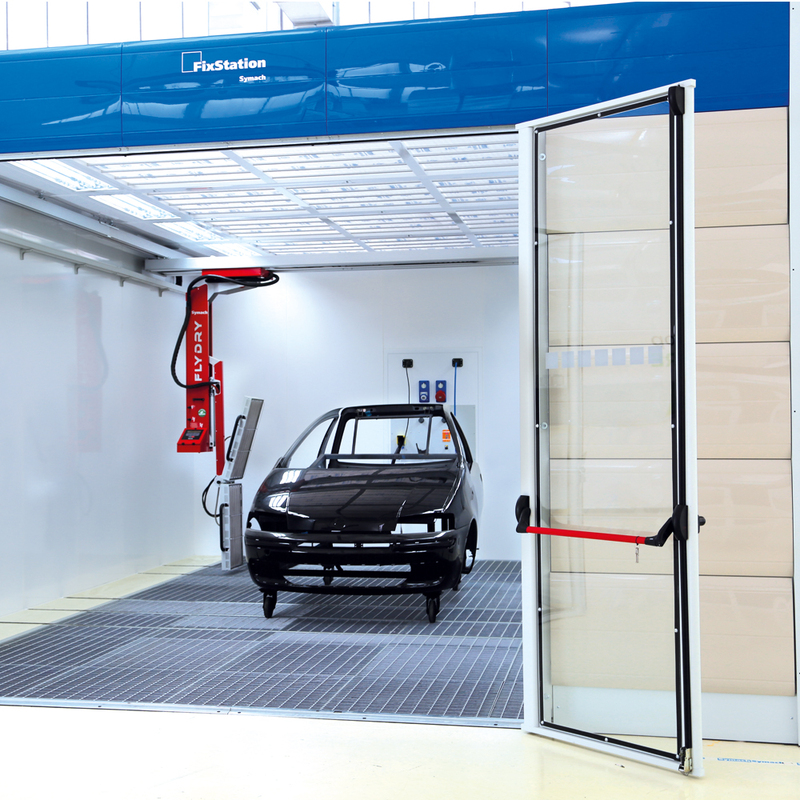 This program offers clean and warm air to the painter when preparing the car to be painted. The FixStation side panel is a tubular-welded frame. Inside the booth, there is a powder-coated metal sheeting; in the middle, there is 5 cm or 2 ” of insulation and on the external side, there is the CoverTop, an ABS plastic panel available in eight different colors. The ceiling is a tubular-welded frame that supports the filters, which are divided into six different boxes that are easy to open to change the filters. The basement is 50 cm or 20 ” deep and the standard grids support a weight of 850 kg or 1,870 lb per point of 10 ” x 10 ”. 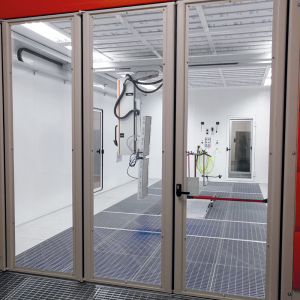 The Fixstation has a front pneumatic door and an optional side pneumatic door that opens and closes vertically to help avoid any dust movement. The FixStation standard model has a ventilation outlet with a fan of 20,000 m3 per hour of 705,000 CFM. The inlet air is from the plenum taking air from inside the warehouse. The FixStation uses PowerLux, an innovative lamp developed by Symach’s research department. It offers superior lighting performance and has a new and exclusive reflector that focuses the light beam with an angle that covers the car from the roof to the vertical bottom side without any dispersion. This new light reaches a quality and power superior to other lights on the market, both on the vertical side of the car as well on the horizontal side, which is very useful to the painter. The outer covering of the FixStation is made of CoverTop panels, made in ABS injection plastic mold that can be opened and closed, allowing installation and/or repair of any electrical or air lines inside the FixStation wall.